Definition at line 57 of file vtkSlicerVolumeRenderingLogic.h. Definition at line 341 of file vtkSlicerVolumeRenderingLogic.h. Definition at line 63 of file vtkSlicerVolumeRenderingLogic.h. Observe all the volume rendering display nodes of the scene. Add a preset to the preset scene. If the optional icon image is specified then that will be used to in preset selector widgets. The icon is stored as a volume node in the preset scene. Load from file and add into the scene a transfer function. Observe the volume rendering display node to copy the volume display node if needed. This function is called automatically when a display node is added into the scene. You shouldn't have to call it. Re-create all volume rendering display nodes of the requested type. Common properties of the display nodes are propagated. Applies the properties (window level, threshold and color function) of a volume display node to the volume rendering display node. If displayNode is 0, it uses the first display node. It's a utility method that internally calls CopyScalarDisplayToVolumeRenderingDisplayNode() or CopyLabelMapDisplayToVolumeRenderingDisplayNode() based on the type of displayNode. Applies the properties (threshold ) of the labelmap display node to the volume rendering displaynode. If labelMapDisplayNode is 0, it uses the first displaynode. Applies the properties (window level, threshold and color function) of the scalar display node to the volume rendering displaynode. If scalarDisplayNode is 0, it uses the first display node. ROI node for cropping When dealing with a volume node that may not have been shown in volume rendering before, it's enough to call this function to prepare them for that. After this, only SetVisibility needs to be called on its display node for showing it. Does not create new nodes if they exist already. Create a volume rendering display node. The node to instantiate will be of type renderingType if not null, DefaultRenderingMethod if not null or vtkMRMLCPURayCastVolumeRenderingDisplayNode in that order. Return the created node or 0 if there is no scene or the class name doesn't exist. If renderingClassName is 0, the returned node has a name generated using "VolumeRendering" as base name. You are responsible for deleting the node (read more about it in the section Get, New, Create, CreateAndAdd). Find first volume rendering display node. Find the first volume rendering display node that uses the ROI. This node reference role name allows linking from a preset node to a volume node that contains an icon for the preset node. For example, the icon is used for representing the node in qSlicerPresetComboBox. Definition at line 294 of file vtkSlicerVolumeRenderingLogic.h. Return the preset presetName contained in the presets scene loaded using GetPresetsScene(). If no presets are found, return 0. If multiple presets are found, the first one is returned. Find volume rendering display node reference in the volume. Find volume rendering display node referencing the view node and volume node. Find volume rendering display node referencing the view node in the scene. Reimplemented to initialize display nodes in the scene. Called after the corresponding MRML event is triggered. Register node classes into the MRML scene. Called each time a new scene is set. Do nothing by default. Can be reimplemented in derivated classes. Inform the logic and observers that a rendering method (class deriving from vtkMRMLVolumeRenderingDisplayNode) is available. The event ModifiedEvent gets fired. Unobserve all the volume rendering display nodes of the scene. Removes a preset and its associated icon (if specified) from the preset scene. Remove ViewNode from VolumeRenderingDisplayNode for a VolumeNode,. Unobserve the volume rendering display node. The default rendering method is set to display nodes created in CreateVolumeRenderingDisplayNode(). If no rendering method is given the VTKCPURayCast is instantiated. Create an opacity transfer function for gradient opacity. It ranges from 0 to scalarRange - scalarRange. Generate and set to the volume property node an opacity and color transfer function from the labelmap LUT colors. Called each time a new scene is set. Can be reimplemented in derivated classes. Doesn't observe the scene by default, that means that UpdateFromMRMLScene() won't be called by default when a scene is imported, closed or restored, only when a new scene is set. Use a linear ramp (true) or a sharp ramp (false) when copying the volume display node threshold values into the volume rendering display node. True by default. If lut is 0, the colors go from black (0, 0, 0) to white (1, 1, 1) If lut contains only 1 value, that color is used for all the generated points. If lut contains more than 1 value, each color is used in the ramp. The generated transfer function will be made of lut->size() + 2 points. The function is then applied to the volume property node. Update DisplayNode from VolumeNode, Can pass a VolumePropertyNode and a AnnotationROINode to be the display node. If they are nullptr and the display node does not already have any, new ones will be created then set and observed to the display node. This property holds the default rendering method to instantiate in CreateVolumeRenderingDisplayNode(). 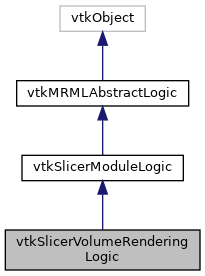 If no rendering method is given, the VTKCPURayCast technique is instantiated. Definition at line 337 of file vtkSlicerVolumeRenderingLogic.h. Definition at line 342 of file vtkSlicerVolumeRenderingLogic.h. Definition at line 345 of file vtkSlicerVolumeRenderingLogic.h. Definition at line 330 of file vtkSlicerVolumeRenderingLogic.h. Definition at line 339 of file vtkSlicerVolumeRenderingLogic.h.